Cornerstones, community members and volunteers continue to restore historic structures. The San Lorenzo Mission Church was originally built in the early 1600’s. In the late 1800’s the structure was in such bad shape, it had to be torn down. A new church, using the original design and traditional building materials was built on the existing foundation and dedicated in 1993. Churches: Symbols of a Community, now Cornerstones, provided technical assistance. 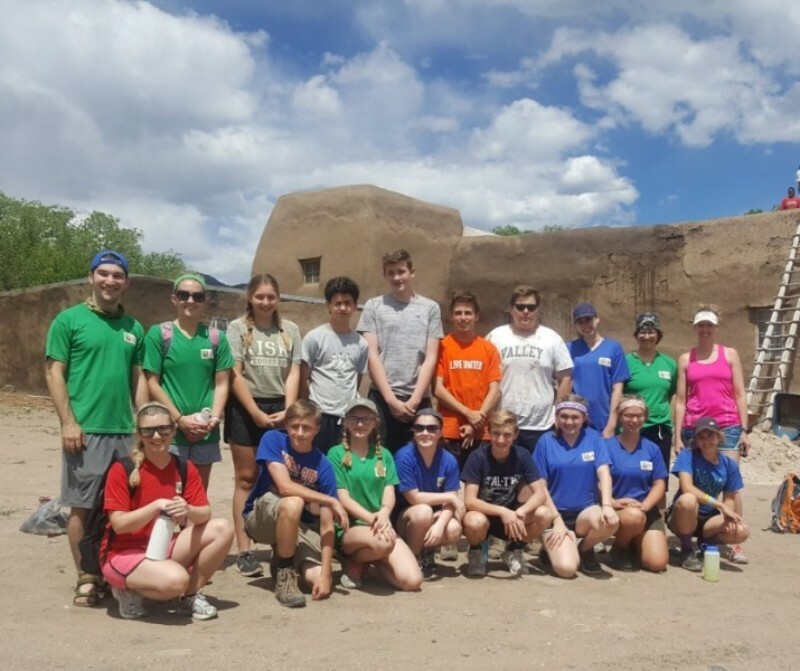 Over the years, renewal of plaster has been necessary and from May 8 through June 8, volunteers from the Picuris Pueblo, the Valley School of Ligonier, PA and a group from Connecticut completed 72 hours of mud-plastering of the Church. To restore the church walls, native soil was screened and mixed with concrete sand at a ratio of 1 to 1.5. This combination makes the material more workable and crack resistant. In recent years, the pueblo has used soil alone which has not performed as well as it should. The new mix was very well received by tribal members. Joe Mermejo, Majordomo in charge of the church, set up the work and was assisted by Donna Rudolf, a Picuris projects consultant. Support and direction came from the Picuris Pueblo Governor, Craig Quanchello and Cornerstones project manager, Don Sena. We thank the many volunteers who helped with the plastering! Although in the mid-1800’s the area was still occupied by members of the Jicarilla Apache tribe, Ocate, 3 miles east of Los Hueros, was settled by Hispanics who, with their flocks of sheep, moved southeast from Taos, looking for new, unoccupied pastures and farmland. They eventually moved west, creating the village of Los Hueros and building their church. A plaque found on the balcony of San Juan Bautista in1986 confirms that it was built in 1895. In 1989, community members of Los Hueros contacted “Churches: Symbols of Community”, seeking help restoring their church. With the approval of the Archdiocese, Cornerstones made a site visit in 1990 to determine its condition. Community volunteers, with the assistance of Cornerstones’ technical advisors, restored and lime plastered the church in 1992. Periodic repairs continue to this day and on June 6, more than a dozen community members and other volunteers showed up to assist in the latest project. 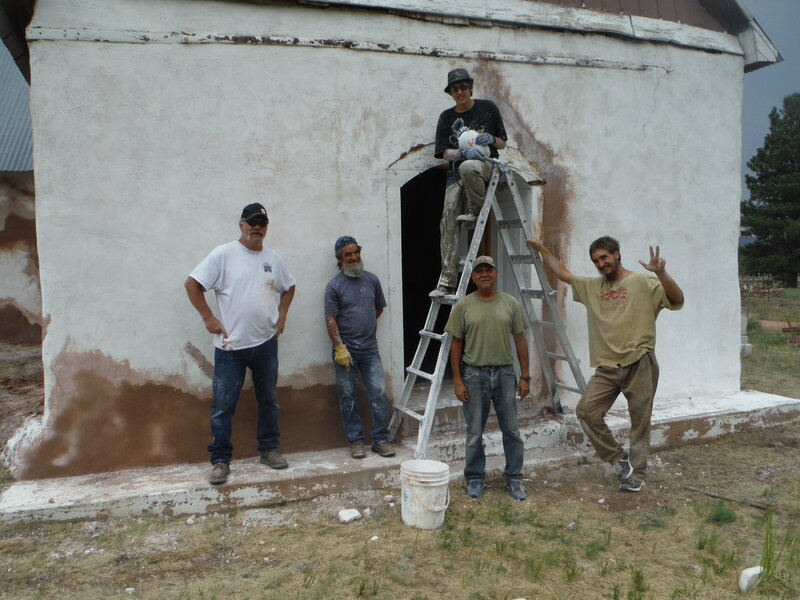 The stripping of old lime plaster off the exterior base, various exterior wall panels, and the re-plastering of these areas with new lime plaster was completed on 6/15/18. All exterior walls were then lime washed multiple times. Cornerstones' interns Robbie Kelly and Santiago Vigil assisted in the work. Robbie started working with Cornerstones as an intern seven years ago when he was 15 years old and has been a steady and greatly valued team member since then. Santiago is 14 years old and is a new addition to our team on that side of the mountain. At fourteen, he is already an accomplished author! Other community members brought food and refreshments for the workers each day. It was a very pleasurable experience working on this structure and much fun was had by all.